Department of Mechanics and Engineering Science, Fudan University, Shanghai Research Center of Acupuncture, Shanghai, 200433. In this paper, we use Stokes, Brinkman and Darcy equations to approximate the porous continuum media of ligament tissues respectively, simulate the flow field with FLUENT software, and study the shear stress on the cell surface due to the interstitial fluid flow. Since the Brinkman equation approaches Stokes equation well in high hydraulic permeability (kp) condition (kp ≥1.0×10-8 m2 in our numerical simulation), and it is an approximation to Darcy model in low kp condition (kp ≤5.0×10-12 m2 in our numerical simulation), we used the Brinkman model to simulate the interstitial fluid flow in the ligament where kp is approximately 1.0×10-16 m2. 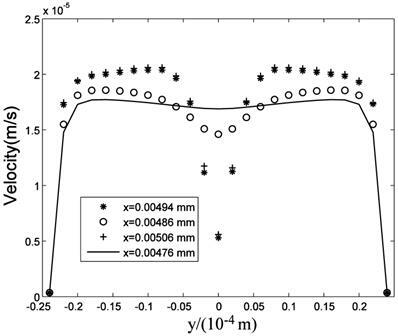 It shows kp and anisotropic property have a little effect on the flow field, but have a great effect on the shear stress on the membrane of interstitial cells (τcell). There is a linear relationship between τcell and , when kp =1.0×10-16 m2 and the maximum τcell (τcell,max) is approximately 10 Pa. The anisotropic property will affect τcell's distribution on the cell surface. When kx/ky>1, low τcell dominates the cell, while when kx/ky<1, high τcell dominants the cell. Keywords: Interstitial fluid flow, porous media, numerical simulation, sheer stress, anisotropy. The interstitium is the space located between the capillary walls and the cells. The basic structure of the interstitium is similar in all tissues: collagen builds a fibril framework that is full of interstitial fluid; interstitial cells are distributed in interstitium. The components of interstitial fluid are very complex, including water, glycosaminoglycan, proteoglycan, proteins and so on. The interstitial fluid volume is as much as approximately 3 times of the blood's volume. Interstitial fluid contacts with the cells more directly than blood does. But the researches on interstitial fluid are fewer than those on blood. Not only the components of interstitial fluid but also its flow plays an important role in the tissue's normal physiological activities [1, 2]. In poorly vascularized tissues such as ligaments and tendons, the flow of interstitial fluid is especially important. Many factors are known to influence the flow of interstitial fluid. First, interstitial fluid and blood exchange occurs at the capillary walls . Therefore, the flow of interstitial fluid is affected by the conformation of capillaries and the penetrating velocity on the wall of capillaries. Second, the space of the interstitium is not empty but full of collagen fibril network, which affects the flow of interstitial fluid. 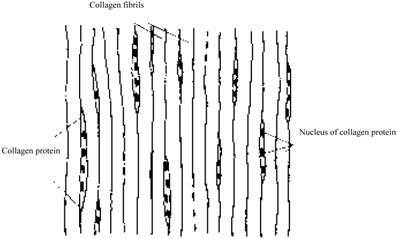 In different tissues the structure of the collagen fibrils are different. For example, in derma, collagen fibrils are organized into meshes and in ligaments, into regular parallel arrays, as shown in Fig. 1 . Third, interstitial cells also affect the interstitial flow. 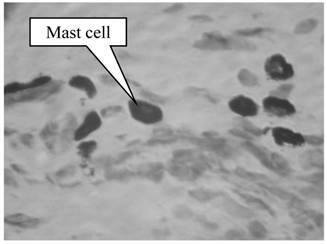 In brain, neurons and glial cells formed the tight central nervous system (CNS) , while in the stained connective tissue, interstitial cells (Mast cells, MCs) are isolated (×400, Fig.2). Configuration of parallel collagen fibrils. Most mathematical models of interstitial flow through fibrous matrix to date present the tissue as a continuum space and Stokes, Brinkman and Darcy equations are adopted respectively to study the interstitial fluid flow [6-9]. For example, Lee and Fung  used Stokes equation to study a thin boundary-layer region near the fibrils surface. Pedersen et al. [7, 8] and we  used Brinkman equation to study the soft tissue. Chen et al. used Darcy equation to study the interstitial fluid flow in ligaments and tendons. In Brinkman and Darcy equations, the properties of the fibrous matrix are represented by a hydraulic permeability kp that averages the flow resistance offered by the porous media across the entire flow domain. Many factors affect the tissue permeability; therefore, it's hard to determine its accurate value which has to be evaluated in most cases. Yet, through numerical simulation, the estimated values of different cases are widely distinguished, ranging from 1.0×10-10 m2 to 1.7×10-17 m2 [7, 9]. In this paper, based on a simple coupled capillariy-interstitium model, we take a computational fluid dynamics (CFD) approach to investigate the following problems: (i) comparison of three equations (Stokes, Brinkman and Darcy) numerical results; (ii) the effect of kp on the interstitial fluid flow and interstitial cells; (iii) the effect of interstitial cells on the flow field; (iv) the effect of the ratio of longitudinal permeability kx (parallel to the collagen fibrils) to the transverse permeability ky (perpendicular to the collagen fibrils) (ratio=kx/ky) on the interstitial fluid flow and interstitial cells. The two-dimensional interstitial fluid domain is occupied by a porous media, the top and the bottom of which are the capillaries (Fig.3). The capillaries collocate parallelly in the x direction: the left side of the capillary is near the arteriole, and the right side of the capillary is near the venule. We denote 2H as the distance between two neighboring capillaries and L as the length of the capillary. The four short lines at the four corners represent periodic conditions and the lengths of the lines are 0.01 L.
where kc is the permeability coefficient of capillary's wall, pi is the interstitial hydrostatic pressure at the capillary wall, πc is the osmotic pressure in blood, and πi is the interstitial osmotic pressure at the capillary wall. Here, according to the Poiseuille's Law , pc will decrease linearly from artery to vein, assuming other parameters are constants. Finally, we impose the nonslip condition along the capillary walls (ux=0). The CFD software package FLUENT (version 6.0) is used for the numerical simulation. The grid is generated by the GAMBIT software package. The governing equations are solved by iterating. 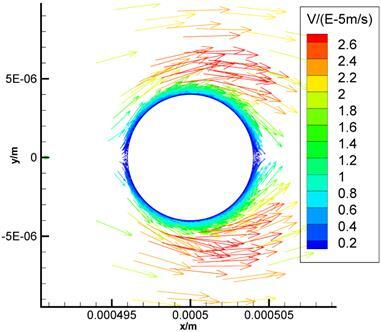 When the iteration is convergent (error of iterated results e<0.001), the velocity field is obtained. Table 1 shows the physiological parameters used in the numerical simulation. Based on these values, the characteristic velocity U=1.33×10-6 m/s. Physiological parameter values of the model. 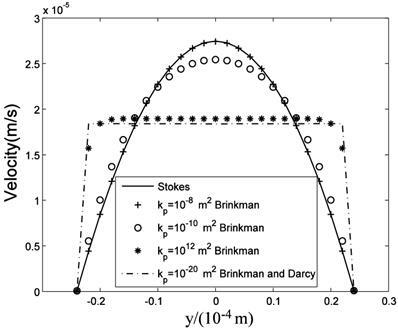 The computational results of Stokes equation and Brinkman equation are nearly the same when kp is large (Fig.4, kp=1×10-8m2, display scale is x:y=1:5), while the results of Darcy equation and Brinkman equation are similar when kp is small (Fig.5, kp=5×10-12m2, display scale is x:y=1:5). The numerical results of Stokes, Brinkman and Darcy equations all show that the interstitial fluids flow from the capillary to the interstitium at the arteriole (left) side and are absorbed by the capillaries at the venule (right) side. Near the x axis (symmetry axis, y=0), the flows' directions tend to become parallel to the capillaries, and the maximum velocities are at the x axis (x≈660μm). 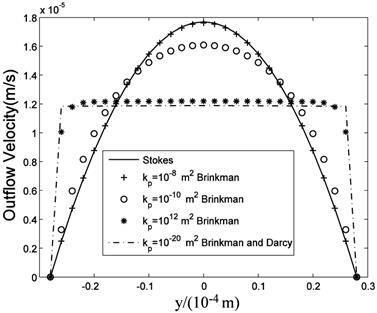 The maximum velocities of Stokes and Brinkman (kp=1×10-8m2) equations are 2.75×10-5 m/s, while the maximum velocities of Darcy and Brinkman (kp=5×10-12m2) equations are 2.01×10-5 m/s. The velocity profile in the cross-section causes the difference between the maximum velocities: the velocity profile of Stokes equation is the parabola shape, which is accordance with Fu et al. 's μPIV measurement  ('+'and 'o' in Fig.6 and Fig.7), while the velocity profile of Darcy equation is nearly equality ('*' and dash-dot line in Fig.6 and Fig.7). The results also show there are boundary layers in Brinkman equation, and the thickness of the boundary layers is positive correlation to kp ('*' and dash-dot line in Fig.6 and Fig.7). 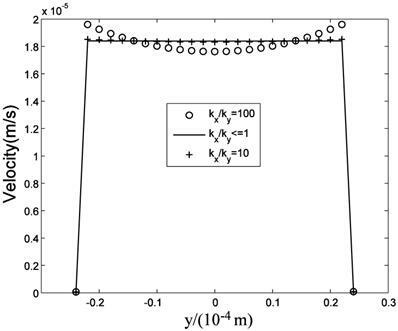 Interstitial flow field in isotropic media (a) Brinkman equation (kp=1×10-8m2), (b) Stokes equation. velocity profile in the maximum velocity cross-section (x=0.66mm). velocity profile at the outlet (x=1mm) . 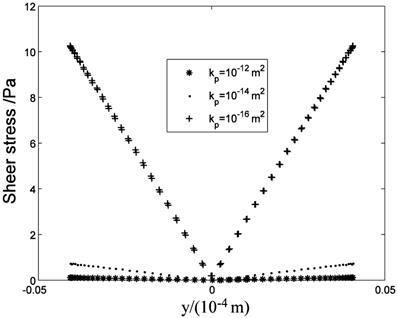 Fig.8 is the flow field near the cell (Brinkman equation, kp=1×10-12m2). The interstitial cell has little effect on the flow field except for the flow field near the cell surface where a boundary layer exists. Interstitial fluid velocity will provide mechanical stimuli to the interstitial cell, and the sheer stress on the surface of cell (τcell) is direct proportional to because of Brinkman boundary layer (Fig.9). Fig.10 shows the cell's influence is approximately 10 μm range, where '+' and '*' represent the velocities in the cross-sections of 2 μm before and after the cell respectively. There are obviously a large variation at |y|<10μm range. 'o' represents the velocity in the cross-section of 10 μm before the cell. There is a slightly change at |y|<10μm range. The solid line represents the velocity in the cross-section of 20 μm before the cell, and it is similar to the velocity without the interstitial cell (dash-dot line in Fig.6). The flow field near the cell (Brinkman equation, kp=1×10-12m2). τcell distribution at the cell surface. While many researches assumed the tissue is isotropic, Chen et al. showed the parallel arrangement of collagen fibrils in ligaments will certainly lead to anisotropic permeability property in the tissue. 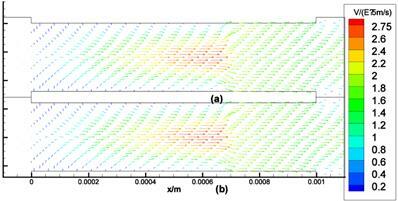 Our simulation results showed that the flow fields are similar when kx is equal to or less than ky, that is when kx/ky ≤1, while the flow fields are different when kx>ky. Fig.11 is the velocity in the maximum velocity cross-section, which shows the velocity profile is more concave-down with the ratio increase. Fig.12 plots the velocity at the outlet, which shows the velocity profile is more convex with the ratio increase. 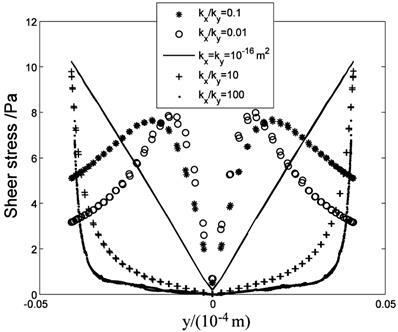 Though anisotropic property will affect the flow field, Fig.11 and Fig.12 show the influence is less when kx/ky<10, and the influence is not great even when kx/ky=100. Based on Chen et al. 's results, the maximum evaluation value of ratio in ligaments is less than 50 . Therefore, the isotropic analysis in some research is acceptable. The anisotropic property will affect the flow field near the cell surface and τcell obviously. Fig.13 shows the low τcell range increases with ratio increasing, and the maximum τcell is at y=±4μm (the top and bottom sides of the cell) when kx/ky>1. When kx/ky=100, τcell at over 85% range of the cell surface(y<±3.3 μm) is under 1 Pa, and τcell increases to 10 Pa quickly near y=±4μm position ('·' in Fig.13). When kx/ky<1, the positions of maximum τcell shift to the left and right sides of the cell and the high τcell range increases ('*' and 'o' in Fig.13, y=0μm represent the left and right sides of the cell). Velocities in the maximum velocity cross-section. Velocity distribution at the outlet. In this study, we explore the nature of interstitial fluid flow in ligaments and compare the results derived from Stokes, Brinkman and Darcy models. Through the simulations, we can make the following conclusions. The interstitial fluid flow is nearly parallel to the capillaries. The difference between these models is the velocity distribution in the cross-section: parabola shape in Stokes model and uniform in Darcy model. The numerical simulation is accordance with the analytical solutions : Brinkman equation approaches Stokes equation well in high kp condition (kp ≥1.0×10-8 m2), while is an approximation to Darcy model in low kp condition (kp ≤5.0×10-12 m2), except for that there exist a boundary layer of magnitude. One group of capillaries will generate 1.2×10-5 m/s (0.07cm/min) velocity at the outlet. If the fluid from the capillaries is not absorbed by lymphatic, it will flow downstream and be accelerated through the next group of capillaries. In the past, it was accepted that the most seepage from the arteriole side of capillary is absorbed at the venule side of capillary, and the surplus is absorbed by lymphatic vessels right away. Since lymphatic vessels are not always near capillary and the seepage from arteries is always more than the fluid absorbed by capillaries, the unabsorbed fluid will travel some distance and even a long distance before being reabsorbed by capillary or lymphatic. Interstitial fluid flow will affect cells bioactivities. To poorly vascularized tissues such as ligaments and tendons, the flow of interstitial fluid is more important to metabolism. Though the interstitial cell has little effect on the flow field 20 μm away from the cell surface, it does affect the flow field near the cell surface. Therefore, for the interstitial cells that isolated from each other (Fig.2), it is reasonable to neglect other cell's effect when study the shear stress on one cell. Interstitial fluid velocity will induce τcell on the surface of cell in Brinkman equation and τcell is direct proportional to , which is accordance with the theoretical analysis . 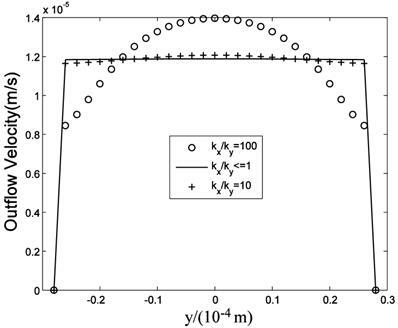 The anisotropic property has little effect on the interstitial fluid flow when kx/ky<1, while has some effect on the interstitial fluid flow when kx/ky>1. The increase of kx/ky will induce the velocity profile concave in the cross-section. We don't know the physiological effect of this concave. Weimbum et al. had found the similar drop in the middle of the cross-section when discussing the flow through an orifice in a fibrous medium . The anisotropic property has obvious effect on τcell. When kx/ky>1, low τcell dominates the cell and the maximum τcell is at the top and bottom sides of the cell. When kx/ky<1, high τcell dominants the cell and the positions of maximum τcell shift to the left and right sides of the cell. This results show that the parallel arrangement of fibril along the capillaries (kx/ky>1) can reduce the mechanical stimuli on cells induced by the interstitial fluid flow. In vitro experiments have shown that subtle fluid flow environment plays an important role in cells' living, reproduction and development [16-18]. For example, Swartz et al. found that collagen aligns perpendicular to subtle flow , and Hayward et al. figured out that the interstitial fluid velocity and tissue shear stress are key mechanical stimuli for the differentiation of skeletal tissues . But the mechanism of the flow's function is unknown. This numerical simulation provides an effective way to explore the in vivo interstitial fluid flow in all sorts of tissues, helps to set up the vivid subtle interstitial flow environment of cells, and is benefit to understand the physiological functions of interstitial fluid flow. This work was supported by National natural science foundation of China (11202053), Shanghai Science Foundation (12ZR1401100), and 973 project (2012CB518502).